NEW LINK HARANGUE.org "...life, liberty, and the pursuit of happiness [originally understood to mean an absolute right in private property]"
Sign your kids up for an American Adventure NEXT Summer ! Complete Writings of George Washington Now Online! Library of Congress. BiblicalEconomics.com the Library of American Enterprise Publications, the home of biblically based, free market books on economics and constitutionally-based limited civil government.Congress. The Avalon Project at the Yale Law School - Large collection of historical documents. Many for the first time online. The Internet Classics Archive at MIT - Read the writings of Cicero among others. MiningCo.com presents the American Revolution and 18th Century History - features info and links. Wallbuilders - Educational and public policy organization dedicated to "rebuilding our nation's foundations." They "...develop materials to educate the public concerning the periods in our country's history when its laws and policies were firmly rooted in Biblical principles." See David Barton's analysis of the terms "high crimes and misdemeanors." Liberty Online: Great site for additional writings of the Founders and Framers. Heritage: Examining the Roots of Constitutional Government, by Left Justified Publicks. 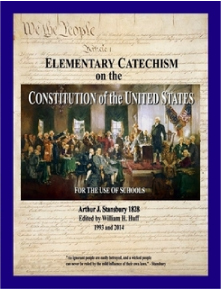 Constitution Society - More Constitutional information.bios, images, etc. Freedom's Nest - Large searchable database of quotes, as well as book list, etc. Citizen's Rule Book - Online version of the popular, pocket-sized, jury rights book with indexed Constitution (see our Catalog to purchase the print version). Project Gutenberg - Reprints from many periods and countries. OverLawyered.com - "chronicling the high cost of our legal system"
Dixieland Law Journal - Larry Becraft, prominent Constitutionalist Attorney in Huntsville, Alabama specializing in "freedom law." FindLaw - Excellent starting point for legal research online. LawGuru - Another good starting point for research. WorldNetDaily - Hosted by syndicated columnist Joseph Farah, with much original content. NewsMax - Hosted by Christopher Ruddy. Also has much original content. The Drudge Report - See what the White House is hot about. Many media and syndicated author links also. Sobran's - Newsletter and website of Joseph Sobran. Blue Eagle - Exhaustive index of online commentators and cartoonists. American Newspeak: "E-zine" presenting news stories validating Orwell's prophecies. The MoneyChanger - Long-running informative newsletter by Franklin Sanders. Mark Twain in His Times - Information project at the University of Virginia. The Big Eye - Discover the Best of the Web. Virtual Reference Desk - "The" site for links in all categories. Philosophy Collections Online - Maintained by Peter Suber at Earlham College in Richmond, Indiana. Political Information - New search engine of political websites. Includes LEXREX! Walden Font Co. - Purchase historical fonts and clip art for your publications. Colostrum - Natural supplement. Read what some doctors say about it at this page. NAET Allergy Elimination therapy - New therapy for treating allergies. Many years ago, men of strong mind, strong will and strong character used to meet in The Green Dragon Tavern. Coming together secretly, and often late at night, they met upstairs in the Long Room. Here . . . they planned the destiny of our country, and plotted the course of freedom which we now sail. Yes, there really IS a VAST Right Wing Conspiracy! Want to join Let Freedom Ring? Want to join the The Real Libertarian Webring?